The design on this South Rosedale property demanded restoration of the historic front facade with traditional materials. Inside, a custom wrought iron railing highlights the grand, central staircase. To bring traditional luxury into the 21st century, we installed an elevator and car lifts within the home, creating a space that will truly live on. This new build features the finest material in the elegant reproduction of a georgian manor. The residence boasts amenities including a media room, wine cellar, and a wellness centre complete with an endless pool, gym and steam shower. Designed by world-renowned architectural firm Diamond Schmitt, The Casa Loma is living, refined. The interior space is a testament to contemporary design, effortlessly flowing into an immersive rear terrace via panelized glass doors. 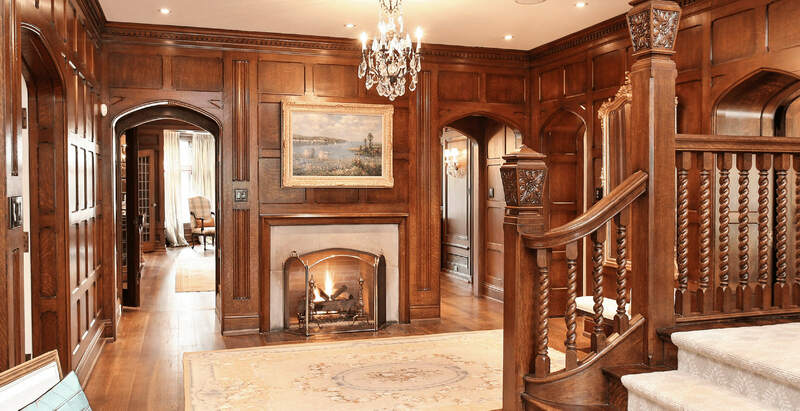 The North Rosedale was restored to a classic Tudor style with traditional elements, as well as some original materiality. The exterior space houses a walled garden and brilliant reflecting pool, with a period coach house and conservatory reflecting a stunning commitment to traditional design.